Our action is to help people in situations of crisis. And ours is not a contented action. On October 15, 1999, the Norwegian Nobel committee announced the last Peace Prize of the twentieth century. It would go, the committee proclaimed with customary fanfare, to the organization Médecins Sans Frontières. Known in English as Doctors Without Borders and in the acronym-friendly aid world as MSF, this group was, strictly speaking, focused on medical humanitarianism rather than peace. Nonetheless, the committee noted the distinctive independence MSF brought to disaster settings. By intervening swiftly and calling public attention to abuses of power, it suggested, MSF's action inspired at least a glimmer of a brighter future. "In critical situations, marked by violence and brutality, the humanitarian work of Médecins Sans Frontières enables the organization to create openings for contacts between the opposed parties," read the citation. "At the same time, each fearless and self-sacrificing helper shows each victim a human face, stands for respect for that person's dignity, and is a source of hope for peace and reconciliation." The award hardly came as a complete surprise. MSF fit a long lineage of humanitarian laureates and had received nominations for a number of years. Indeed, given that the founder of the Red Cross movement had shared the very first prize in 1901, it seemed fitting to end the century on a parallel note. What better way to frame a bloody, violent era than with variants on the red and white symbols of medical care? As usual with the annual Nobel ritual, a flurry of news reports, mostly laudatory, profiled the committee's choice. Since MSF originated in France, the French press went into a particular paroxysm of celebration. To the annoyance of MSF's current members, considerable attention was focused on Bernard Kouchner, one of the group's founders who had subsequently become a significant European political figure. Many reports emphasized Kouchner's signature issue-the doit d'ingérence, or right to intervene on humanitarian grounds-a concept that his successors at MSF had increasingly disavowed even as variants materialized in international precedent. Alongside gauzy allusions to peace and hints of civilizing redemption, the accounts predictably emphasized national pride: this was France's great gesture of civil society, its response to Britain's Amnesty International and Switzerland's Red Cross. At the same time, the reviews skirted more controversial moments in the group's history, including the still-raw wounds of Rwanda. As congratulatory letters poured in, celebration, not controversy, was the order of the day. For its part MSF basked in the attention, worried about how to respond appropriately, and debated what to do with the prize money. December saw an award ceremony in Oslo, where representatives of the organization frantically drafted a final version of their collective address and donned special T-shirts to silently protest the Russian bombing of the Chechen capital Grozny. The speech sought to outline MSF's humanitarian vision and concerns, drawing a sharp distinction between MSF's actions and those of a state. "Humanitarianism occurs where the political has failed or is in crisis," it proclaimed, rejecting humanitarian justifications for political agendas. MSF's action was a struggle, and its independence included a right to witness and speak out. The T-shirt protest and subsequent march to the Russian embassy sought to exemplify this at a moment of heightened exposure. Although the small gesture drew no immediate response, the BBC subsequently announced that the Russian government had extended an ultimatum in the conflict, expressing concern about civilian suffering. As for the prize itself, MSF decided to invest the funds in its new initiative to combat neglected diseases and its campaign for greater access to essential medicines worldwide. The celebratory mood continued though the final midnight of the year, when a young doctor from the group officially dropped the ball in New York's Times Square, ushering in a new millennium. For all its obvious and sanctimonious pomp, the Nobel moment marked a watershed for MSF. Once considered a youthful and ragtag oppositional movement, the organization had grown into a fixture of international relief efforts and garnered official approval. Le monde, France's most established daily, described the group's mythic trajectory out of Nigeria's Biafran uprising as "the challenges of a generation." Other reports cited Paris's own turmoil in 1968, while Montreal's English-language Gazette, decrying the "humanitarian occupation of Third World countries," offered a more biting formulation: "Medical hippies go mainstream." At the opposite end of the spectrum a cartoon in a French satirical publication showed a young doctor returning to his stuffy, bourgeois parents, who wondered why he couldn't have received the medical prize instead. Nearing thirty, MSF had clearly come of age. What was less clear was whether or not the group would experience some sort of midlife crisis, growing complacent, as some of its adherents feared, or preserving the status quo, as some of its critics charged. Had humanitarian action-even in its outspoken and independent form-grown routine? At the time of the Nobel announcement I was already curious about Médecins Sans Frontières. Like many people I was familiar with the group's fundraising efforts, having received its solicitations from time to time. I also knew people who had worked for them. The name intrigued me, since the phrase "without borders" had grown synonymous with global mobility. Moreover, the humanitarian focus on saving lives suggested a universal appeal: minimal morality through emergency care. At the same time, MSF practiced medicine. The group's members not only spoke, but also acted, mounting complex missions in diverse settings. Their collective work combined technology and morality with a practical form of anthropology, defining and contesting a sense of humanity worldwide. This was indeed an attempt at global medicine. Memoirs aside, much of the writing about nongovernmental organizations I could find at the time dealt with the topic from a methodological or theoretical remove. Some analysts surveyed a range of groups to create comparative models. Others positioned the recent prominence of civil society and the NGO form within a larger framework of neoliberal reform and privatized welfare. I sought a view closer to the ground, one involving historical detail and the loose ends of experience, albeit one more systematic than an individual memoir. For an anthropologist of my generation and orientation, what people did mattered as much as what they said. I knew MSF was venturing into new areas, such as the above-mentioned pharmaceutical campaign, and a major effort to treat AIDS. Before addressing those developments, however, I wanted to grasp the group's traditional customs and habits. The first task of studying this NGO, then, would be to examine its call to arms and vision for action. In the Nobel address, MSF defined its mission as helping "people in situations of crisis," quickly adding that this endeavor was not "contented." Beyond a general principle of the alleviation of suffering, then, the group's version of humanitarianism clearly depended on a concept of crisis. The life that MSF sought to save was not an ordinary one, in the sense of being burdened by everyday complaints. Rather it was the life located in an exceptional state of risk. Indeed, a persistent sense of urgency infused all of MSF's rhetoric and work. Although the group may have devoted its prize money to a new initiative for pharmaceutical equity, the Nobel citation reflected MSF's central public image: an emergency room team, on call worldwide. As I soon discovered, the details beneath that image proved more complex: the group included volunteer nurses, engineers, and administrators alongside doctors, relied on an army of local employees to perform a considerable part of the actual labor, and had grown to conduct a diverse range of missions. Nonetheless, the emergency idiom captured the organization's essential ethos. Both crisis and emergency are native terms for MSF. Whereas the first indicates a critical condition or conjuncture, often including social and political contexts, the second references a more specific set of problems requiring rapid medical response. In this work I will largely adhere to MSF's distinction. Moreover, I suggest that the line that distinguishes emergency from the more fluid concept of crisis raises unsettling questions about the group's humanitarian rationale and purpose. While emergency missions may no longer be the norm, they still represent a self-consciously "classic" form of action within MSF. Not every member may dream of being "eight to a tent in the Congo," as one veteran put it to me in Kampala in 2003, but such dramatic conditions remain romantic points of reference for the collective, and a sense of urgency courses through most of the group's rhetoric. To quote another of its former adherents, MSF "couldn't survive without the word emergency." At the same time, the organization addresses a wider field of problems, not all of which fit into an ambulance. As I detail later, AIDS and pharmaceutical equity are certainly crises from MSF's perspective, but they are not exactly emergencies. Both terms, however, prioritize the present over the past and the future. Moreover, they suggest a state of rupture and through it an imperative need for action: something must be done and done quickly. In this sense disaster-not development-lies at the heart of the organization. "We are much more attached to the notion of crisis," the French section's communications director told me in 2003, describing the group's particular niche in the wider aid complex. "A community has developed in its own particular way, encounters a moment of crisis, so we help them face it and then move on." In this formulation at least, humanitarianism has come to define itself through exception. In the fall of 2000, MSF brought a traveling exhibit to several sites in greater New York and Los Angeles. Part of a special publicity campaign on behalf of displaced people entitled "A Refugee Camp in the Heart of the City," it featured a model camp that could be moved and displayed in any public venue. At each stop the exhibit also served as a de facto reunion for former aid workers, who came together both to raise public awareness and to see old comrades and like-minded souls. Staff at MSF's New York office assured me it would make for an excellent entrée into their world. Thus on a beautiful September morning I found myself in Central Park, the light clear and bright as it filtered through the buildings. A small group of MSF veterans milled about before a temporary enclosure, white shirts emblazoned with a bright red insignia. Throughout the day, they issued identity cards to a growing stream of visitors, shepherding them through a circle of structures representing a simulated refugee camp: tents and prefabricated huts, a mobile clinic, and a mock latrine. This was a year before New York itself would experience the immediacy of disaster and five years before Hurricane Katrina would strike New Orleans. The images of panicked, fleeing people appeared comfortably remote, a problem of elsewhere. The camp here was a model, after all, meant to convey the gist of the humanitarian labor involved in caring for displaced populations to those who had only encountered glimpses of such things on television. Led by aid workers, including some former refugees, the tours offered another experiential reminder of human suffering and need through a display of the materials used to respond to them. In the name of research, I went on several tours over the course of the day. Although each varied in detail and emphasis according to the background and personality of the person leading it, the general pattern remained. The first section of the exhibit illustrated basic needs: shelter in the form of simple tents adapted to different climates, water purification in the form of a giant bladder dispensing five gallons per person per day, food in the form of compact bars providing 2,100 calories, and finally hygiene in the form of a latrine (the "VIP version") that was equipped with both a folk painting about hand washing and an ingenious method of trapping flies. To one side hung a small poster about mental health and trauma and beyond lay the medical zone, featuring a model clinic, a weighing station and vaccination center, and finally a cholera exclusion area. The tour closed with a depiction of land mines and a photographic testimonial to the plight of refugees. As the press release for the event noted, the core of the exhibit emphasized "basic elements" of refugee existence. Here was a panorama of survival, in all its measured essence. When confronted by emergency, people's lives shrank to elemental, species-level needs: a place to stay, some means of sustenance, and collective cleanliness. Without these they would suffer, fall ill, or even die. At moments of crisis, the exhibit made clear, life itself was on the line. Humanitarian concern, therefore, focused on providing temporary substitutes for immediate necessities. Longer-term issues, although recognized, remained on the sidelines. Life in Crisis tells the story of Médecins Sans Frontières (Doctors Without Borders or MSF) and its effort to “save lives” on a global scale. Begun in 1971 as a French alternative to the Red Cross, the MSF has grown into an international institution with a reputation for outspoken protest as well as technical efficiency. It has also expanded beyond emergency response, providing for a wider range of endeavors, including AIDS care. Yet its seemingly simple ethical goal proves deeply complex in practice. MSF continually faces the problem of defining its own limits. Its minimalist form of care recalls the promise of state welfare, but without political resolution or a sense of well-being beyond health and survival. Lacking utopian certainty, the group struggles when the moral clarity of crisis fades. Nevertheless, it continues to take action and innovate. Its organizational history illustrates both the logic and the tensions of casting humanitarian medicine into a leading role in international affairs. 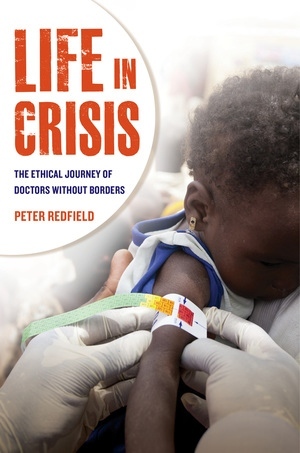 Peter Redfield is Professor of Anthropology at the University of North Carolina. He is the author of Space in the Tropics: From Convicts to Rockets in French Guiana.